Egnyte is one of the quintessential anti-unicorns. But that hasn't stopped it scaling, innovating and building a strong business. But the technology industry downturn over the past few months has called the unicorn model into question. All those companies that poured incredible amounts of money into growth at all costs, and purposely ignored revenue and profitability, went out on a serious limb -- and there is going to be some real pain as many of these companies have their valuations trimmed radically. But all the while that the Ubers, Boxes and SnapChats were raising their monster rounds, other companies were going along a much more cautious route -- raising (comparatively) modest amounts, focusing on revenue acquisition and keeping a close eye on the bottom line. A good example is Egnyte. The company, which offers enterprise file sharing and synchronization (EFSS) is in a similar space to Box, Dropbox and Syncplicity. But there is a product differentiation that Egnyte holds -- since its inception it has focused exclusively on enterprise and at the same time has settled on being a hybrid EFSS vendor. Unlike Box and Dropbox which are very much cloud pure play companies, Egnyte prefers to give its customers choice as to their deployment methodology. And as for that modest and prudent approach towards business: Egnyte has raised only $62.5 million to date. A lot of money assuredly, but nothing like what other vendors have raised (for reference, including its IPO, Box has raised just shy of $900 million while Dropbox, still a privatively held company, has raised over $1.1 billion to date.) And while having less money to throw at customer acquisition has certainly limited the steepness of their customer growth curve, Egnyte is still doing just fine. They've seen 60 percent annual growth for the past four years. Egynyte's 300 employees service some 14,000 customers, fully 100 percent of which are paying. Freemium has no place in this company! Customers like NASDAQ, Ikea and M&C Saatchi trust Egnyte to provide them EFSS solutions, which straddle on-premises, private and public cloud modalities. But it would seem that simply being a hybrid EFSS vendor isn't enough for Egnyte. The company is today announcing an entirely new product line, Egnyte Protect, along with a renaming of its core product to Egnyte Connect. To this end, Egnyte wants to offer what it calls an intelligent platform for content. The idea being that Egnyte Protect will offer data governance across all of an organization's content -- on-premises and cloud, in end-user applications or standard document repositories. Protect covers content in the cloud (Box and Egnyte at first, OneDrive and Dropbox slated to come soon) as well as content on-premises (in products from SharePoint, Windows File Servers and NAS drives with Documentum soon to come) Egnyte Protect is a SaaS hybrid product, offering near real-time alerting to content policy infringements across cloud and on-premises repositories. 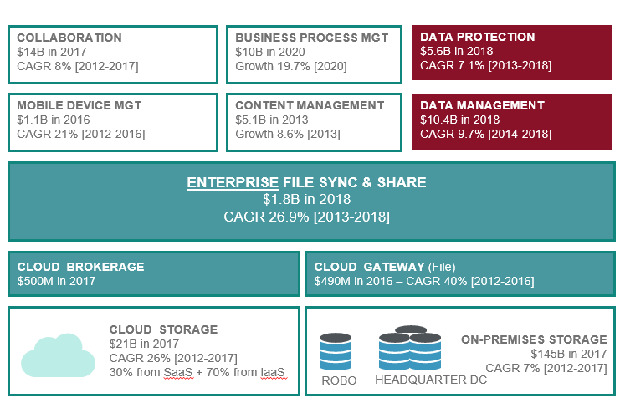 Given that Egnyte is storage agnostic it is, unlike pureplay EFSS vendors, uniquely positioned to collect, analyze and classify all the different activities surrounding customers’ business content no matter where it’s stored -- in the cloud or on-premises. The initial product launch covers access control and offers identification of issues with customer access and permissions to ensure the appropriate files are viewed by the appropriate people. Egnyte is promising a six-monthly cadence of product releases and has the next few features already announced -- selective encryption, data residency assurance and data retention. And Egnyte has done the math on what this means for their potential revenue. The diagram at the top of this post highlights just how much they're increasing their total addressable market with this change. The company is going to be selling Protect as a standalone solution, but one suspects there will be some sweet deals to encourage cross selling between the two main Egnyte offerings. What's not to like? New addressable market but one that is relevant to the existing customer base. Not to mention answering the very real requirement for hybrid options. Egnyte has always thought differently and acted differently, Protect is another example of that.